When Martha McNaught, funeral arranger at Anderson Maguire’s Springburn branch, received a message to organise the funeral of William McLelland who had died alone with no living relatives, Martha knew that there was more to William’s life than first met the eye. Martha decided to find out all she could about William and her tenacity resulted in a funeral fit for a hero in his hometown of Wishaw. Martha commented: “When we were asked to arrange Mr McLelland's funeral, I realised that he was a World War Two veteran and I was keen to ensure that he was laid to rest in a manner which would honour him. 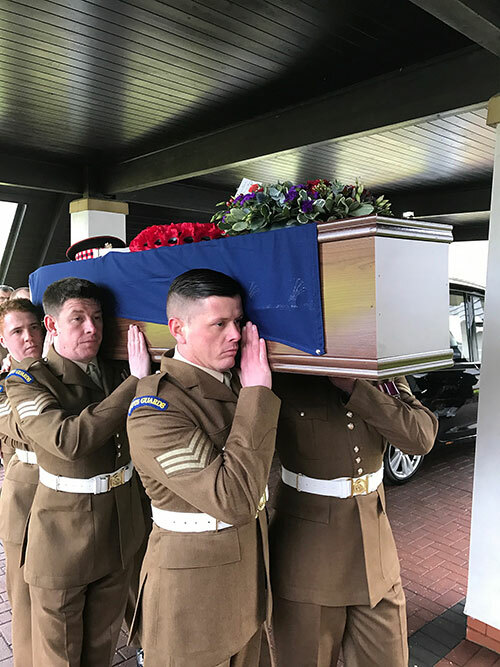 Following a plea issued through the Scottish media and on Anderson Maguire’s social media platforms, serving members of the Scots Guards and members of the British Legion plus local residents gave William a send-off to match his services to his country. A Scots Guards piper played lament in front of attendees at the service in Holytown Crematorium, which included members of the Scots Guards and the Regimental Association, paraded to pay their respects. Mr McLelland fought with the 2nd Battalion Scots Guards in the Western Desert Campaign in North Africa. He spent two years as a Prisoner of War in Italy before he was repatriated to Scotland at the end of the war. Martha said: "We were humbled and honoured to have arranged a funeral service which was a fitting tribute to Mr McLelland's service to his country."